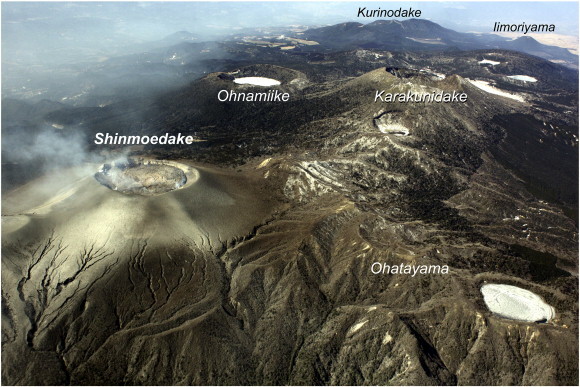 Evidence collected following the 2011 eruption of Japan’s Shinmoedake volcano suggests that the powerful event affected the behavior of an active caldera nearby. A single magma reservoir deep beneath Japan’s Kyushu Island may feed two of its most active volcanoes. GPS measurements of Aira caldera show that its once steady inflation stalled while the nearby Shinmoedake volcano erupted in early 2011 and then resumed when the eruption stopped. This suggests that the two volcanic areas draw from a common magma source deep under Kyushu and that the two areas may interact before, during, and after eruptions. “We observed a radical change in the behavior of Aira before and after the eruption of its neighbor,” Elodie Brothelande, lead scientist on the study and a postdoctoral researcher at the Rosenstiel School of Marine and Atmospheric Science at the University of Miami in Florida, said in a press release. “The only way to explain this interaction is the existence of a connection between the two plumbing systems of the volcanoes at depth,” she said. Observations of interconnected volcanic systems like this one are rare, so finding and studying them may help forecasters improve their eruption prediction and hazard models, Brothelande told Eos. Her team published its results in late June in the journal Scientific Reports. Shinmoedake, which is part of the Kirishima volcanic group in southwestern Japan, began erupting in January 2011 and released more than 20 million tons of magma, ash, and pyroclastic rock. Watch a snippet of this eruption in the video below. 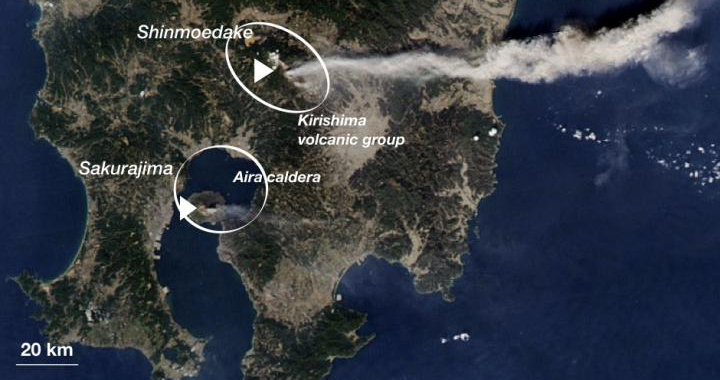 To probe the possible connection between Shinmoedake and Aira, the researchers measured the vertical and horizontal displacements of the land in and around Aira caldera. They gathered daily GPS data from 32 stations in Kyushu spanning 2009–2013, 2 years before and after the Shinmoedake eruption. With these data, they calculated how Aira swelled and deflated in the time surrounding the eruption. 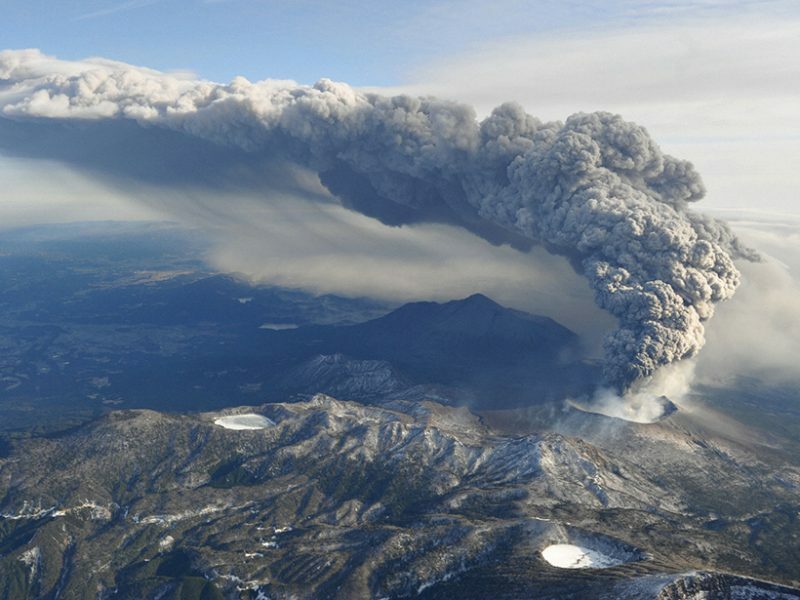 The researchers compared the caldera’s behavior to models of how it would have reacted had it been responding only to geologic stress caused by Shinmoedake erupting. They found that Aira’s behavior was inconsistent with having geologic stress as the primary cause: Its pattern of inflation and deflation was wrong, and the amount it deflated didn’t match predictions. However, the models showed that an underground magma reservoir in the mantle feeding both volcanoes could explain the caldera’s behavior during the nearby eruption. Brothelande said that Aira and Shinmoedake are “good candidates” for this type of connection because they share the same active fault block and are relatively close to each other. By Allen F. Glazner, John M. Bartley, and Drew S. Coleman 22 September 2016. Here’s how that scenario would have worked: In the period before Shinmoedake’s eruption, the magma reservoir inflated both volcanoes. The eruption then rapidly drew magma up from the reservoir and caused a sudden drop in pressure underground. The reservoir, in turn, drew magma from Aira in response to the pressure drop, causing the observed caldera deflation. 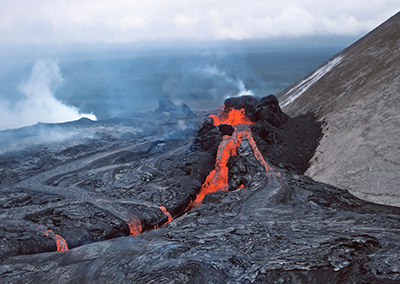 Once Shinmoedake finished erupting, the magma reservoir resumed filling both volcanoes. “When a volcano enters a period of unrest or eruption, a common concern from communities and media is the chance of a neighboring volcano being ‘triggered,’” said Janine Krippner, a volcanologist and postdoctoral researcher at Concord University in Athens, W.Va., who was not involved with the project. Although the research is very promising, more evidence is needed to solidify the ties between the two volcanoes, Krippner added. For example, repeat observations of the volcanoes during the time before and after an eruption, as well as geochemical analysis of the pair’s eruption products, could help. “I would expect to see similarities in geochemistry trends—the magma ‘genetics’—in eruption products like lavas, volcanic ash, and pyroclastic deposits if they have a common source,” she said. Past geochemical [Journal of Volcanology and Geothermal Research] studies have shown that eruption products from the two volcanic systems have similar isotope ratios for strontium and neodymium, the paper notes. However, Brothelande told Eos, a “real comparative study is still required” to geochemically link Shinmoedake and Aira to a common source. Shinmoedake and Aira’s associated volcanic peak, Sakurajima, erupted in 2017, and each has seen ongoing intermittent activity throughout 2018. The research team is planning to study the activity at Shinmoedake and Aira from the past 2 years to better understand their underground connection. 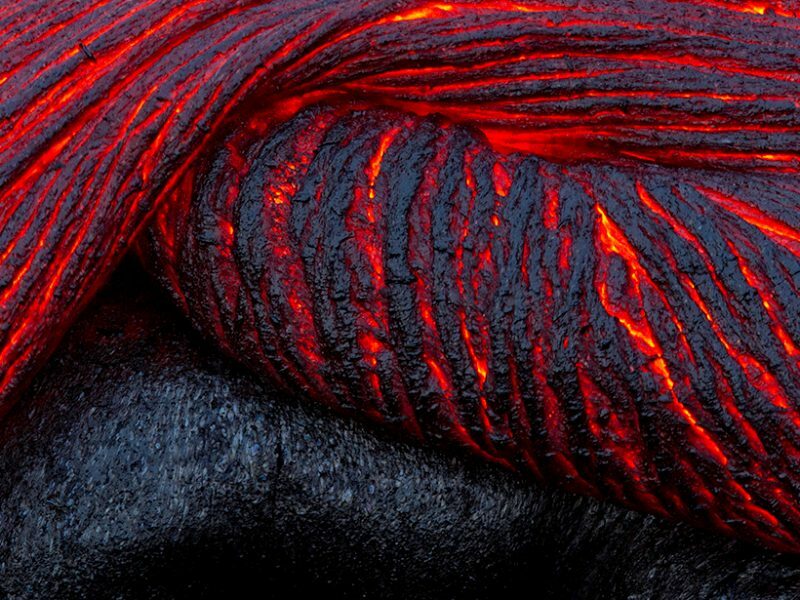 Brothelande pointed out that there are other volcanic systems in which similar hidden connections may cause a volcano to interact with its neighbor, for example, in Hawaii, Alaska, and Italy. This occurs even in smaller systems of lava domes and maars like those in France and Colorado. Models that calculate eruption probabilities, she said, likely need to include these interactions.